Whether you are managing a large team, planning a group project or organising daily tasks, a clear outline of next steps will always make you more productive. 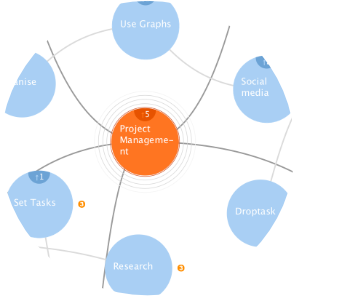 Use iMindMap 10 Ultimate’s Time Map View to build an optimised workflow for your projects, tasks and teams. This unique view will help you keep track of projects from start to finish with ease, and help you to celebrate key milestones along the way. See our simple steps below and learn how to streamline your workflows for better productivity with iMindMap 10’s Time Map View. In Time Map View, assemble your ideas on a visually rich timeline and transform them into actionable tasks. Along your timeline, use brightly coloured tasks to represent each step and action you need to take to complete the project. Once steps have been defined, add start and due dates to know exactly where your time needs to be spent and ensure that every action is taken on time and in a logical order. We’ve all experienced that overwhelming feeling of trying to get new year projects off the ground. Where do I start? What’s the budget? When is this task due? These are all familiar questions that run through our heads when we’re about to launch a project. With external and internal factors to consider and timescales to adhere to, that new year project can sometimes be hard to kickstart. Prepare well to avoid feeling overwhelmed and give your projects the best chance of success using iMindMap 10 Ultimate’s five unique workspaces. With views to suit every stage of the project management process, you’ll be able to visualise information and plan thoroughly to ensure you’re on the road to achievement. Read on to learn our 3 top tips to get your projects off the ground in 2018 and make project pitfalls a thing of the past. Sometimes deciding where to begin can be the most difficult part of starting any project. Fast Capture View requires no strenuous thinking. Its quickfire nature allows you to instantly shoot your thoughts and ideas onto the workspace canvas. The free-form structure of Fast Capture View enables your brain to explore fleeting thoughts and helps to spark associations with similar ideas. Without having to worry about formatting, you’ll be able to explore every single avenue of your project, all within one Fast Capture session. With Christmas done and dusted and a new year approaching, now is the time we start thinking about our aspirations for the year ahead. We may kick off the year with good intentions, but the majority of our New Year’s resolutions are long forgotten by February. iMindMap Ultimate will help you to leave bad habits in 2017 and ensure you enter 2018 with well-planned, powerful objectives to help boost your chances of success. If you’re struggling with new ways to set and achieve effective goals, we’ve noted down our most powerful tips below, so you can hit the ground running this January. Before you enter the new year, think of all the things that you’d like to achieve in a year’s time. Commit to your goals by creating a physical record in Mind Map View. Did you know that you’re more likely to achieve your goals when you record them? In your Mind Map, take advantage of the radiant branches, vibrant colours and meaningful images that can be added to emphasise your key points. Your Mind Map will create a visual, structured and memorable representation of your objectives, encouraging you to go on to achieve your goals. It’s hard to believe that 2017 is nearly over. While we’re excited that a fresh new year is upon us, it’s important to keep ourselves motivated and productive right until the very end of the month. Now that we’re deep into December, it’s crucial to stay on top of your holiday marketing campaigns in order to hit those end of year sales and start the new year with a bang. But with the distractions of Christmas and New Year all around, it can become too easy to let important work slip through the cracks. With iMindMap Ultimate, we’ve made it simple to map out your priorities for the end of the month, assess progress to date and look forward to the future with fresh ideas, ensuring that you welcome the new year with a fully-loaded schedule for 2018. Read on to discover our tips for staying on top of your work with iMindMap Ultimate. We’ve all used phrases such as ‘there’s not enough hours in the day’. The question is, are you using the time you’ve been granted wisely? Think about it, in just ten minutes it’s possible to become more creative and more productive. If you make slight changes to your early morning routine, we promise that in return you’ll be able to warm up your brain, raise your productivity levels and put yourself in the right mindset for a more fulfilling work week. Below, we’ve noted down our non-daunting top tips for starting your week right with iMindMap Ultimate and creating a perfectly productive morning ritual in just ten minutes. While your tasks for the coming week are fresh in your mind, open Fast Capture View to quickly capture your initial thoughts. Don’t worry about formatting, that’s not what Fast Capture View is about. Quickly jot down your thoughts and ideas, leaving no stone unturned. While firing your thoughts onto the page, think about what resources you will need and who you should work with. Start up any early ideas you have with the help of self-organising, vibrant idea bubbles. This quick-fire round could be the most productive time of your day. When you brainstorm your strategy for a new product, there are a lot of variables to consider before its launch. What’s your target market? Who are your competitors? How are you going to promote it? Covering all bases is no easy feat, but thinking and planning with iMindMap makes it simpler to comprehend. With its radiating branches, a Mind Map will seamlessly guide you through each stage of your product plan. No stone will be left unturned thanks to the clear visual overview your Mind Map provides. Follow our 5 steps below with iMindMap’s Mind Map View, and go into your product launch with confidence. As an entrepreneur, your brain is often overflowing with ideas for new ventures that you hope will bring further commercial success. But how can you know if your next service or product is viable? And is the current marketplace ready for it? Conduct a PESTLE Analysis using iMindMap to decide. In need of a creativity boost? Our founder, Chris Griffiths, explains why you need to do more than just ‘think outside of the box’ in his TEDxCardiff Talk. When you’re tasked with a research project it can be hard to know where to start. Often you will spend more time coordinating your sources than on the actual research itself. Getting your notes together, saving links to relevant facts and organising your results can be an arduous task. With the added pressure of working in a team and hitting deadlines, a research project can soon become an overwhelming and dreaded task.